The Form I-9 often feels like a hopelessly antiquated process, stuck forever in a time when good penmanship was highly valued and a 12-pound laptop would have been considered light. Never mind the fact that many employers still complete their I-9s by hand on a piece of paper, and store the records in boxes or metal filing cabinets. The real anachronism for HR managers across the US is the actual verification process. Despite numerous revisions and countlessly revised nuances, the Form I-9, at its core, still has the same document review standard from 30 years ago: the physical examination of original documents to determine if they are reasonably genuine and relate to the employee presenting them. For some employers, this process is a relatively straight-forward step that is completed without much fanfare. For others, it raises all kinds of odd questions/statements. I think this document is acceptable, but it’s not on the list. Where do I find the document number? Is a laminated SS card okay? I was told we can’t accept expired documents, but the employee is insisting this document has been extended? What gives? Why can’t we just have a list of ALL documents that are acceptable? If any of these questions sound familiar, you’re not alone. The Form I-9 has long suffered from the scourge of legislative and regulatory bottlenecks – meaning, that despite public outcry, employers are by and large stuck with the Lists of Acceptable Documents until someone changes the law. The good news is that there is now more publicly available information on acceptable Form I-9 documentation than ever before – almost to the point where HR has too many potential resources to consult. To cut through some of that, we’re going to focus today on a source which has actually been around for many years, and was recently updated in February 2018. It’s the “Guide to Selected U.S. Travel and Identity Documents”, publication number M-396. The M-396 is a pamphlet-style book that is published by the ICE Homeland Security Investigations Forensic Laboratory (HSI-FL), and is designed (primarily) for law enforcement personnel seeking assistance in identifying the various U.S. documents associated with travel, employment and identity. As noted in the pamphlet, it contains a non-comprehensive sampling of document images – some appropriate for I-9 purposes, and some not. Years ago, the M-396 was the best “official” reference source that employers could use for learning more about specific US identification documents. Today, however, employers can view a fairly detailed set of pages on I-9 central and the M-274 Handbook for Employers (which is now online). The M-396 though still has some useful information (and sample images) that are worth checking out – especially if you often encounter documents that are a bit out of the norm. Below, are three examples of documents that present “special” challenges for HR when completing section 2 of our favorite form. The USCIS issues a Certificate of Naturalization (Form N-550) to lawful permanent residents who obtain US citizenship through the so-called naturalization process. More than 700,000 individuals are naturalized every year (based on recent statistics), and the Certificate of Naturalization serves as proof that an individual has obtained U.S. citizenship. But, the Certificate of Naturalization has a somewhat complicated relationship with the Form I-9. For many years, the Certificate of Naturalization was an acceptable List A document, showing both identity and work authorization. 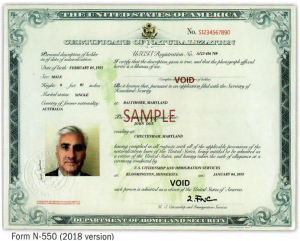 However, starting in November 2007, the Certificate of Naturalization was removed from the list (along with several other documents) because it lacked sufficient features to help deter counterfeiting, tampering, and fraud. In October 2010, the USCIS redesigned the Certificate of Naturalization to include new security features such as an embedded digitized photo and signature, background featuring color-shifting ink, tamper-resistant printing technology, and standardized sizing. Despite these enhancements however, the document is still absent from List A.
But…did you know that the Certificate of Naturalization is an acceptable List C document (falling underneath the “catch-all” employment authorization document issued by DHS)? This means that you can accept this document as evidence of employment authorization, but you must also request the employee to produce a List B identity document as well. Is this piece of wisdom on the Form I-9 instructions or the M-274 handbook? Nope. You have to dig through I-9 central to find it. So consider yourself enlightened! Most employers are familiar with the permanent resident card (more commonly known as the “green card”), which serves as a List A document for Form I-9 purposes. Employers may, however, also run across its predecessor, the “Alien Registration Receipt Card” which was first introduced in 1977 and phased in over a period of time. This version of the card includes the individual’s photograph (profile view), fingerprint, signature and A-number among other details. With travel into (and out of) the US at an all-time high, many individuals are enrolling in so-called trusted traveler programs which allow for expedited security screening and border processing for pre-approved travelers. There’s now a wide variety of programs including Global Entry, Nexus (for travel between the US and Canada), and Sentri (travel from Mexico). What do any of these programs have to do with the Form I-9? Well, as it turns out, their identity documents are acceptable as a List B ID card issued by a federal government agency , since they contain a photograph and various identifying information. If you accept one of these documents for Form I-9 purposes, you must also ask for a list C document showing work authorization. And before you ask…no, this information is not in the Form I-9 instructions or the M-274 handbook. You can, however, find it among the dozens of questions and answers on the I-9 central Q/A page. Antiquated as it may be, the verification process is still an essential component of Form I-9 compliance – forcing employers navigate the delicate balance between ensuring that a document is acceptable while also providing employees with every opportunity to demonstrate their ability to work in the US. Walking this tightrope is not easy for sure, but HR can often find clarity through frequent I-9 training, consultations with immigration counsel, and the use of smart tools which incorporate and simply the various guidance docs that are now available. Printed copies of the M-396 can be ordered by completing CBP Form 262, which is available on the Customs and Border Protection National Distribution Center website. If you’d like to learn more about the Guardian Electronic I-9 and E-Verify system, including our specialized I-9 document insights and sample images, please contact us here.